Arriving at Pasongsongan, Madura, to inspect a flamboyant fishing fleet returned from its nightly fishery on the Java Sea. All photography by Jeffrey Mellefont. Thirty years ago, field-research for the museum took me to a remote little Indonesian island called Raas in the Java Sea. It was so far off regular motor-ship routes that I took passage on an engineless trading prahu propelled by a huge lateen sail. Prahus like these, called lete-lete, provided transport and livelihoods for Raas and adjacent islands, and some of them were sailed on long-haul fishing expeditions into northern Australian waters. The museum, which at that time was just beginning to develop its collections and first exhibitions, wanted to learn more about various types of maritime contacts linking Australia and Indonesia. 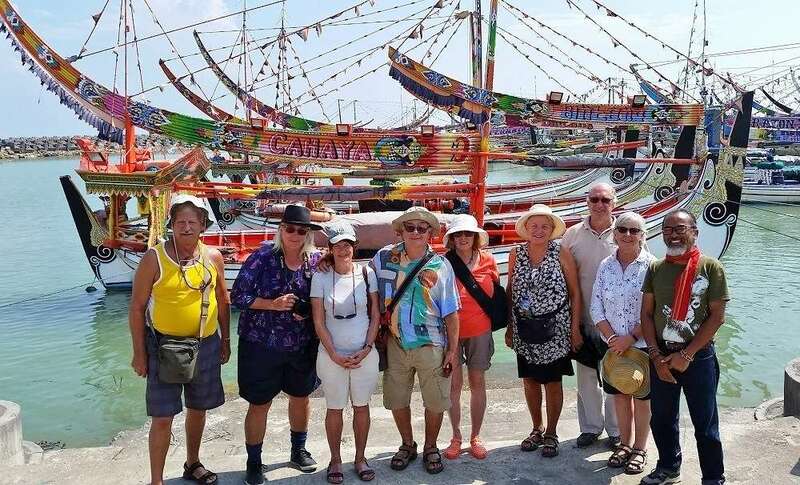 This autumn I returned to these same waters, leading a small group of visitors from Australia, the UK and Canada who were eager to meet some of Indonesia’s least-known maritime communities, in a region of the Java Sea where tourism has not yet arrived. Raas is one of a chain of isolated islands stretching 250 km east from Java, out to a group of reefs, sand cays and larger islands called the Kangeans. In the 1980s and 1990s, when I first visited this island chain, it was a rich field for observing traditional boat-building and sailing techniques surviving by necessity in an underdeveloped economy. Just as rich was the diversity of ethnic groups that had settled there, migrants from the larger islands of Madura (near Java) in the west and Sulawesi to the east. All were seafarers, depending entirely on the surrounding seas and reefs for subsistence. The Kangean Islands are less than 160 km north of the popular resorts of Bali, but due to their isolation and lack of suitable transport they could be on another planet as far as tourism is concerned. Up until this year, that is, when our group sailed in and dropped anchor. Pinisi-style Katherina and her outboard tenders carry up to a dozen guests into out-of-the-way locations in remote parts of Indonesia. Making this possible was a company called SeaTrek, specialising in what might be called ‘maritime cultural tourism’: presenting – and helping to preserve – this huge archipelagic nation’s diverse maritime cultures and marine environment. Our voyage was on their 40-metre, six-cabin, auxiliary-sail Pinisi Katharina, one of two ships they operate that can deliver small tour groups to the most remote locations. The voyages are led by specialists in fields such as ecology, anthropology and history, who share their knowledge with the guests. While equipped with all modern comforts, safety and navigation gear, Katharina was hand-built of tropical-forest ironwood by Indonesian shipwrights in the style of the engineless pinisi ketches that traded all over the archipelago through much of the 20th century. In fact her lineage goes right back to Indonesian fishing fleets that visited northern Australia from pre-European times. 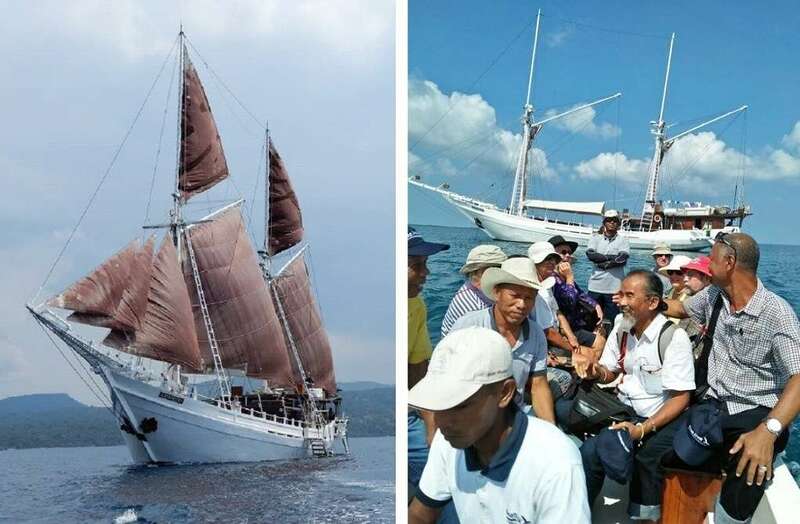 SeaTrek’s ships are living embodiments of this heritage, and by using their auxiliary sailing rigs when conditions allow, a new generation of Indonesian crews learn and maintain sailing skills at risk of vanishing with the modernisation of a once-huge sailing fleet. As one of SeaTrek’s occasional lecturer-guides, in my post-retirement life as an honorary research associate of the museum, I wanted to develop a new cruise to those places I’d visited years ago while working for the museum. Returning there recently for a pre-cruise survey, and to renew contacts, was an adventure in itself, sailing in from Java on a small, overcrowded local prahu transport that still used an auxiliary lateen sail to back up its noisy diesel motor. Our guests on Katharina set sail in far greater comfort, in the calm period between the wet and dry monsoon winds this year. After an overnight sail from Bali our first landfall was Pagarungan Kecil in the Kangean archipelago. Welcoming us with music and dance, since this was the first ever visit from a group of foreign tourists like us, the islanders conducted us around their sandy, palm-shaded home that’s just a few kilometres in circumference. They showed us how completely they engage with the sea – catching, farming and transporting fish, cultivating edible seaweed and pearls, boat building and trading among the islands. 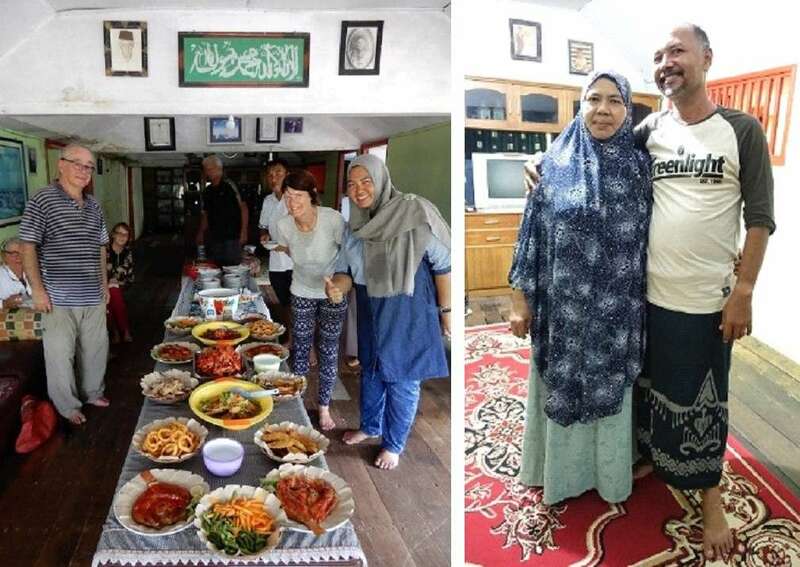 The home of our hosts on Pagarungan Kecil island in the Kangean group; at right: maritime trader & entrepreneur Abdul Rauf and his mother Ibu Fatma. Our principal hosts were a prosperous family of traders and shipwrights, recent descendants of seafarers from Sulawesi and Lombok, and of wandering merchants and missionaries from Arabia’s Hadramaut province. That’s typical of this maritime melting pot at the crossroads of the Java, Bali and Flores Seas, and the Straits of Makassar. As honoured guests we shared a festive seafood feast in their spacious family home, erected on stilts to catch the breeze. They proudly invited us to inspect the fine new mosque they had gifted to the community, built in the traditional Indonesian pagoda-roofed style. The Kangean islands are a linguistic melting pot, too, with the various languages of Sulawesi and Madura widely spoken. But the other language used by everyone is that of the Kangeans’ earliest migrants – the Sama-Bajau or Sea People. Also known as sea gypsies, these are the legendary, landless folk who once spent their entire lives afloat in small family boats, from birth to death. Most have now built villages on stilts on unclaimed islets or tidal margins. Their seamanship and intimate knowledge of the marine elements are awe-inspiring and unmatched. 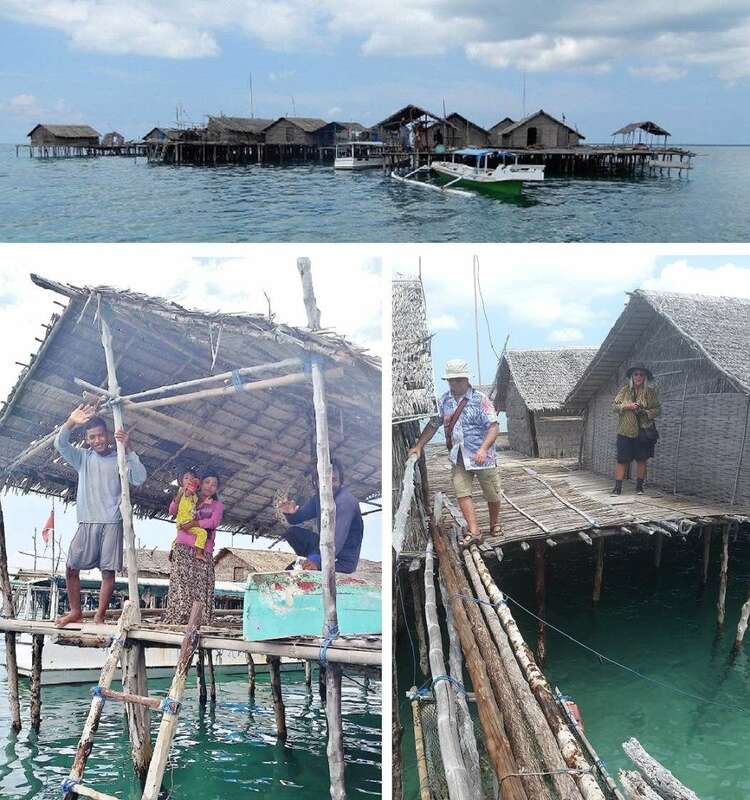 Sama-Bajau (sea-gypsy) village Takat Lanjang, built on a submerged coral reef in the Kangean Islands. A highlight for our guests, as Katharina threaded the Kangean Islands, was visiting a sea-gypsy kebungin: a village that rises astonishingly from the sea, elevated on mangrove poles planted into a completely submerged coral reef, or takat. Just as astonished to be visited by us, the sea-gypsy inhabitants of Takat Lanjang welcomed us and answered our questions about how they built and maintained their mid-ocean hamlet with its decking, walkways and houses of split bamboo and palm-thatch. They also showed us how they wove fish traps of rattan cane, and their latest harvest of rainbow-hued reef fish. 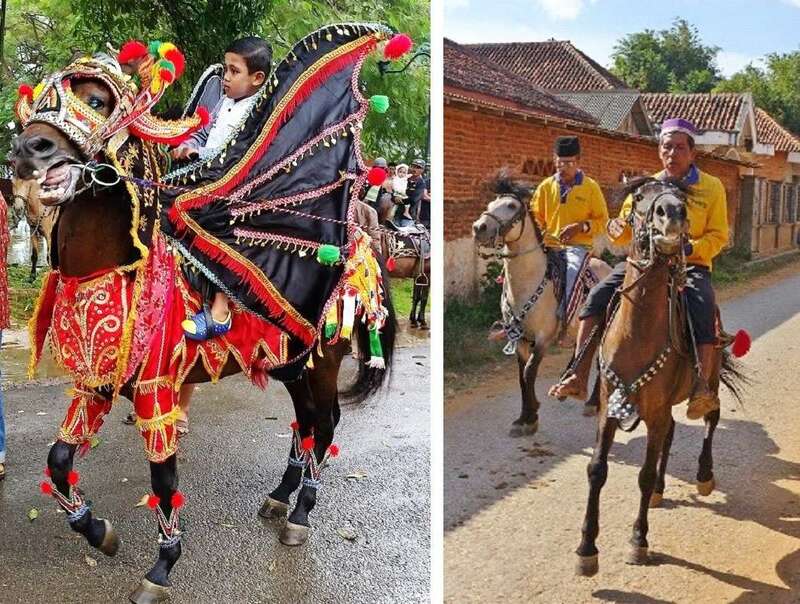 On the island Kangean Besar, harvest festivals, weddings and other major life-cycle events are marked by ceremonies of horsemanship, the tamratan caran kencak. By contrast, the largest and hilliest of the Kangean islands has fields of rice and corn, with ridges covered in forests of teak – the tough, durable timber favoured by boat builders. Here we witnessed a unique harvest-festival or rite-of-passage ceremony staged out of season, just for us, called tamratan caran kencak. Extravagantly costumed dancing horses performed to the beat of gongs, drums and flutes, while many proud pairs of horsemen competed in races and an elegant dressage contest. Cruising past Raas we voyaged westwards to the large island of Madura, just off Java. Madura has a turbulent history of ancient dynasties, sultans and Muslim saints, warriors and royal war fleets. Today it’s known for a gladiatorial cult of bull racing, magic love potions, a vibrant batik textile style and blacksmiths producing deadly kris knives. Yet even so, despite being easily reached from Java, only a few foreign tourists ever visit. Mesjid Jamid or grand mosque of the former royal capital Sumenep, Madura, built in 1763 to a design by refugee Chinese architect Lau Pia Ngu. In its eastern capital Sumenep, the seat of old Madurese kingdoms as well as the Dutch during their long rule of the East Indies, we visited a spectacular 18th-century sultan’s palace and harem baths, grand mosque and royal grave sites with their unusual Chinese, Indian and Portuguese architectural influences. At the palace we were received like royalty by classical dancers and gamelan orchestra, and ushered into the regal reception hall for a Madurese banquet. 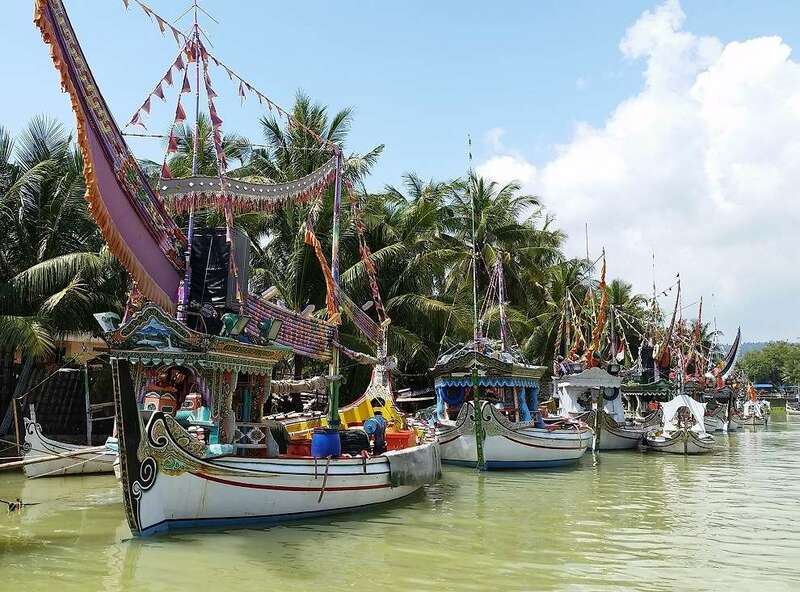 Pride and prosperity are evident in the day-to-day, working livery of fishing boats called perahu pursen moored along the river bank in Pasongsongan, Madura. But it’s Madura’s hardy seafaring culture that’s been my primary interest over many decades. Today’s Madurese shipwrights are the creative builders of the world’s most spectacular traditional fishing fleets, steeped in artistry, ritual, religion and magic. To see some we drove to the quiet north coast where big, vibrantly decorated, solid-teak fishing boats line the banks of palm-shaded river ports, covered with carvings, paintings, ornaments and bunting. The artistry and imagery mix high court traditions with robust folk styles, religious themes with pop culture. We toured one river by boat, and ashore we watched the vessels being hand-built using age-old skills and rituals, meeting builders, boat owners, fishermen and artists. 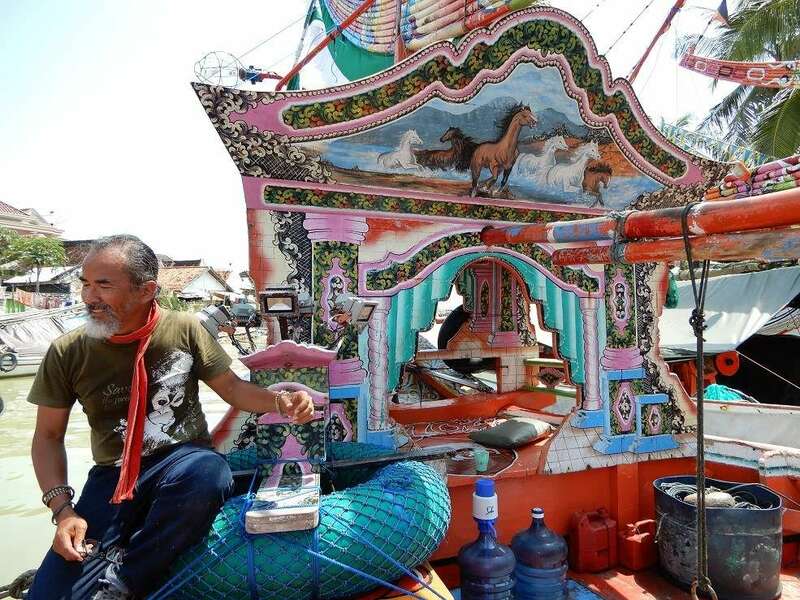 Our Javanese tour director Narto has climbed on board for a closer look at this decorated helmsman’s shelter on a Madurese perahu pursen fishing boat. Crossing the Straits of Madura, our homeward voyage took us down Badung Strait, dominated by Bali’s sacred volcano Gunung Agung – the Lord of Mountains. It was a voyage that broke new grounds, sailing from Indonesia’s most intensive tourist location to one of its least-visited regions. We’ll be going back in early 2019.